﻿Part practice can beneficial for cognitive learners, the skill can be broken down into sub-routines, which means there is a reduced chance of information overload. An example of part practice is in swimming, the swimmer can hold a float to neutralise the arms and focus on perfecting the leg stroke. It allows the performer to focus on a part of a skill they may be struggling with, so it is most useful for low-organisational skills. However, part practice doesn't develop a kinaesthesis for the movement and doesn't work on the skill as a whole. ...read more. Varied and distributed practice are also useful techniques for learners with short attention spans. Varied practice has a number of benefits. It can improve both selective attention and skill detection of warning signals. 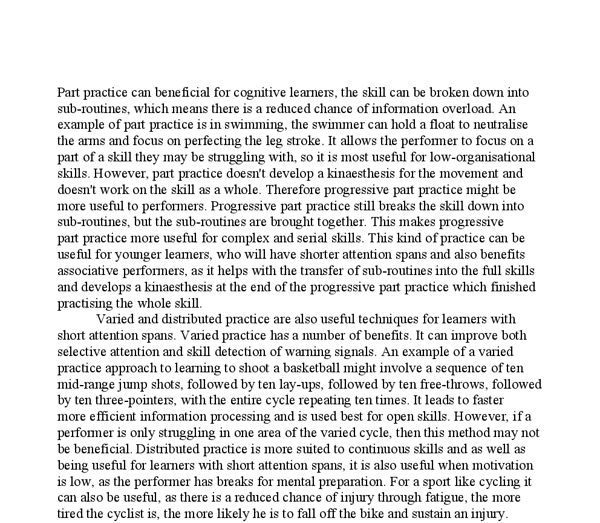 An example of a varied practice approach to learning to shoot a basketball might involve a sequence of ten mid-range jump shots, followed by ten lay-ups, followed by ten free-throws, followed by ten three-pointers, with the entire cycle repeating ten times. It leads to faster more efficient information processing and is used best for open skills. ...read more. For a sport like cycling it can also be useful, as there is a reduced chance of injury through fatigue, the more tired the cyclist is, the more likely he is to fall off the bike and sustain an injury. 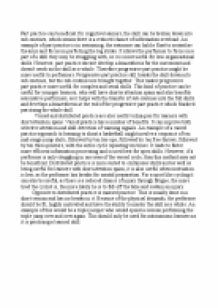 Opposite to distributed practice is massed practice. This is usually done in a short session and has no breaks in it. Because of the physical demands, the performer should be fit, highly motivated and have the ability to master the skill as a whole. An example of this would be a triple jumper who would spend a session performing the triple jump over and over again. This should only be used for autonomous learners as it is practising a learned skill. ...read more. different people sometimes use different stances to do the same skill) Motor abilities are "relatively enduring traits which are generally stable qualities or factors that help a person carry out a particular act" (E. Fleishman). Meaning that abilities are usually traits you are born with but can be trained to become improved. * Vitamin E is found in vegetable oil. Why minerals? - They are inorganic substances that our bodies need for a variety of functions. Calcium is vital to health, especially during growth in childhood and adolescence. It is concerned with the formation and maintenance of bones and teeth, and helps to make the bones strong. Goals should be 'S.M.A.R.T.E.R' Specific, Measurable, Agreed/Accepted, Realistic, Time phased, Exciting and Recorded. A common neglected feature of fitness instruction is thorough analysis and evaluation of performance AFTER a task or training session. The types of abilities are: Speed, power, balance, co-ordination, agility, reaction time, flexibility and timing. Skill, technique and abilities are all linked together in the equation: Skill = Ability + Technique + Practice Different skills require varying abilities and techniques; but they all necessitate training/practice in order to become perfected and 'skilful'. In a game of invasion there are a lot of things and people around in your vision but your brain would concentrate on the player you are marking. The brain only registers everything the sense organs detect for a very short moment, if we do not attend it further it fades out of our system.